This is the first time in 38 years that I have not personally participated on a national meeting of our party. But I know that I am present through each one of you, every PT leader, delegate and militant. Over these 38 years we have built the most important political force this country has ever known. Because we are born from the grassroots, the working class at the city and the countryside, fighting for democracy and justice. And never, in any moment, we got away from the people. We came to the government by voting, after a long learning process, to transform Brazil. And we transformed. We overcome misery and hunger. We brought water to those who suffered with drought and electric light for those who lived in darkness. We take the children to school and the young people – black, poor and native Brazilians – to the university. These are things that might seem simple in any civilized country, but which made a huge difference to our suffering people. And this was possible only because we always put the workers and the poorest in the centre of government attention. We have created one of the largest and best income transfer programs in the world, “Bolsa Familia”. We increase the real value of the minimum wage. We provide credit for workers, the retirees, and for family farming. We create 20 million jobs. In many governments before our own, the vast majority of the population was treated as if it were a problem. We treated our people as a solution, and that is why Brazil has changed. We have proven that it is possible to do different and better than they have ever done before. Today our people are suffering. The hunger has returned to the homes and many have no more homes: they are living in the streets; they have become beggars along with the children. Millions of workers gave up looking for a job, because there is not. Millions were excluded from “Bolsa Familia”. Universities and hospitals are experiencing their greatest crisis. Today our country is being sold. Our Petrobras, our pre-salt, Eletrobrás, the public banks; all in line to be delivered by the cheapest price to large foreign groups, as they have done with Embraer. Our foreign policy was again dictated by the US State Department. Today our democracy is threatened. 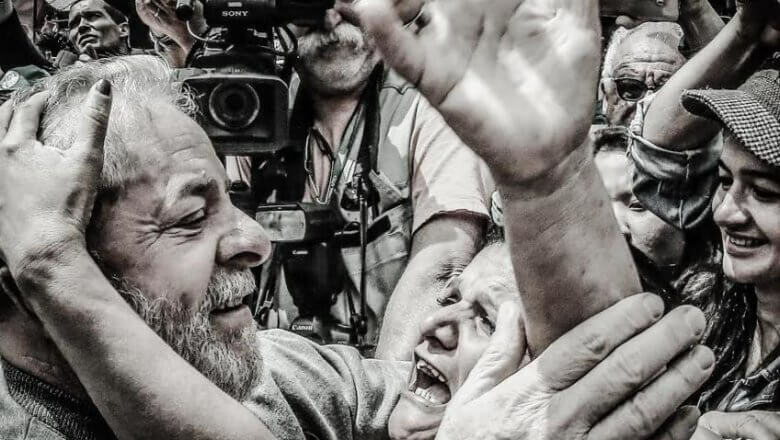 Two years ago they struck a parliamentary coup to oust President Dilma Rousseff, tearing up the constitution. Now they want to make a presidential election with marked cards, excluding the name that is ahead in popular preference on all the polls. They have already overthrown an elected president; now want to veto people’s right to choose freely their next president. They want to invent a democracy without people. This Worker’s Party national may be one of the most important in our party’s history. The responsibility that lies ahead is enormous. Today’s decision will lead us to an unrestricted struggle for democracy, the Brazilian people and Brazil. And victory will depend on the commitment of each one of us. I would like to be there to embrace every comrade. To thank you for all the solidarity and especially for keeping the PT spirit alive even in the most difficult circumstances. From where I am, I am always renewing my faith that the day of our reunion will come, by the will of the Brazilian people. Long Live the Worker’s Party!